What is focus collecting? Simply put, it’s when you decide on a theme or “focus” for your collection. While it’s pretty common for people to decide on a certain type of item to collect (vintage toys, for example, or statues), a focus collection does the opposite. Instead of choosing a particular kind of item, you choose a particular character or theme, and collect many types of items that fit that theme. 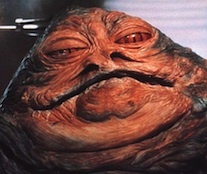 As you’ve probably guessed, my focus is Jabba the Hutt. Nearly anything that features him or his retinue is fair game. Of course I also collect other things such as statues and figures of the main Star Wars characters, but I’ve had a lot of fun with this focus. There are a lot of focus collectors of vintage action figures, and I think this is partially because after collecting for a certain number of years you get to a point where you have all the common items that you want, so you need to find something a bit more rare to concentrate on. A lot of these collectors like to buy up every version of their character’s figure and packaging, often getting relatively minor variations with different mail-in offers or from different countries. At the moment, anyway, this doesn’t really appeal to me. I’m more interested in getting a wide variety of item types — the quirkier the better, in many cases. For me, a lot of the appeal is seeing how the same character has been portrayed by different artists and in different media. With Jabba in particular, I really like seeing how they interpret his design differently, often turning a pretty grotesque looking character into something very cute. I think it’s incredible that there’s so much Jabba merchandise out there. Any particular favourites? Any items that you’re trying to track down? Are there any fantasy items that you’d like to see made? I also saw on the RS boards that Jabba’s Sail Barge was voted as a favourite by collectors for Hasbro to release. Hi there. I have an Ackbar focus collection and I blog about it here: http://ackbarstrap.wordpress.com/ I also added your blog to my Links section, where I link to a few other focus collectors. It’s good to see other focus collectors out there, especially for a character like Jabba – there’s plenty of Fett and Vader collectors, but I don’t believe I’ve seen another Jabba focus site before. Great stuff. Thank you very much! I hope to eventually showcase my collection the way you do with yours on this site, but without a good camera, it’s hard. In the meantime, I blog other Ackbar news and things. Thanks for the link. Those figures have been around for a while. I have one that’s supposedly a pencil topper, and one that’s on a sort of spring that makes it kind of like a bobblehead. Just can’t see how you can afford all this stuff, I mean there are some people who would love to have this stuff but can’t afford it…. flashing it all over the internet is sort of rude to me. I think so at least, like saying “look at all my stuff” so it seems sort of rude. I’m not a particularly rich person — I choose to spend my money on this instead of buying a fancy car or house. Do you go to car blogs and tell them how rude it is to post pictures of their cars? I’m not bragging here — I’m trying to provide information and entertainment. But ultimately nobody is forcing you to read the site, so if it offends you please go elsewhere. http://www.ebay.com/itm/Airbrushed-Star-Wars-Jabba-the-Hutt-Figure-Clone-Wars-/141617198943?hash=item20f90af75f:g:CM4AAOSwBLlVFA8r I started but its not cheap! Look what i found! i collect only characters i like ! Are you on facebook!